This entry was posted on April 5, 2018 by Corp Conv. When it comes to cleanrooms, cleanliness and efficiency go hand-in-hand. In order to keep your controlled environment running as smoothly as possible, every facet of the room needs to be clean, functional, and where it belongs. 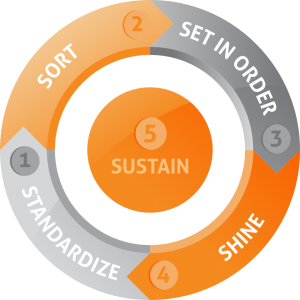 Our solution is simple: a five-step system designed to keep your cleanroom operating at maximum efficiency. First used in Japanese automotive factories, the 5S System is a thorough, step-by-step cleaning and organization method designed to be repeated daily. Each of the five steps serves a distinct purpose in maintaining your cleanroom when done properly and on a regular basis. Identify and eliminate any unneeded or misplaced objects from the cleanroom. Outside items cluttering your workspace can quickly build up and become a hazard, as well as hinder productivity; removing them immediately is the best way of avoiding distraction and slow-down. Everything has a place. Make sure every piece of equipment has one static location it belongs in the cleanroom, and that they always find their way back. We recommend taking a look at our selection of acrylic organization solutions. Misplaced tools are an epidemic, and we can work together to stop it. This is where the real cleaning comes in. Every surface and every instrument in the environment should be cleaned, inspected, and disinfected. Fortunately, proper cleaning techniques are our specialty. For a more in-depth look at how to effectively clean your controlled environment, check out our deep cleaning guides. Make the rules and enforce them. The 5S system is only as effective as the people using it, so keep everyone up-to-date on where everything belongs in your cleanroom. Repeat the above steps every day. The best way to make sure the 5S system is being used to its full potential is to establish a routine and adhere to it daily. Repeating each step after every day of operation ensures that your workplace remains clean, efficient, and safe. Of course, this is only a brief overview of the 5S System and how it benefits you and your cleanroom. For more information, call and speak with one of our cleanroom experts or check out our Education and Buying Guides. Our team of cleanroom experts are here to help. Call us at 877-719-4470 or send us a message. We strive to bring you the latest relevant information.